One of the most challenging questions for Christians to ask themselves is whether they are more Christlike today than they were a year or even a decade ago. Even among those of us active in our local churches on a regular basis, this question can lead to awkward silence and, perhaps, even prevarication. If we are brutally honest, most of us cannot claim to be more Christlike today than we ever have been and that should give us some pause to think. It’s not that we should be perpetually living on some sort of “mountain top” spiritual experience. Christlikeness has very little to do with how we feel, but it has a whole lot to do with how we live. And the question of how we live is not a question of our avoidance of sin. Most of us don’t drink, smoke, chew, or hang with girls that do. This isn’t simply about ethics. The question of spiritual progress has a great deal more to do with the normal advance that takes place as we mature as Christians. Unfortunately, for many of us, that advance looks less like progress and more like a slow slide backward or an attempt to tread water while pretending to be moving ahead. Every year we make new resolutions. We are going to pray more, lose weight, memorize Scripture, and be more diligent in a hundred different ways. However, it seems that a few weeks later our will-power has failed and we have slid back to where we started. 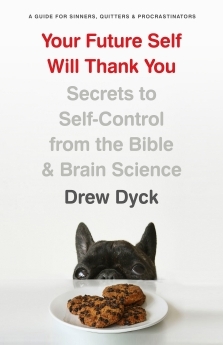 Drew Dyck’s recent book: Your Future Self Will Thank You: Secrets to Self-Control from the Bible & Brain Science, is, despite its clunky title, a very helpful book. It is a quick read, but well-written and robustly researched. This book belongs in a reading list with other books on spiritual disciplines. The basic topic of this book, as the subtitle indicates, is self-control. This seems to set the volume up for two potential errors: legalism and self-reliance. Dyck is careful to avoid both. He does this by reminding readers that self-control is a biblical virtue (e.g., Prov 25:28, 1 Cor 9:25) and by noting that self-control is a fruit of the Spirit (e.g., Gal 5:23). We cannot earn salvation by being more self-controlled, but growth in godliness should result in greater self-restraint. The Bible points us toward the need for self-control as a sign of and means to pursue spiritually maturity, but that leaves those of us who struggle with the virtue pondering why we can’t just be better. That’s where the science comes in. As someone who struggles with self-control, Dyck set out on a quest to figure out why. This took him through a year or so of reading the literature available in the field of psychology and brain science. He has helpfully distilled the results in this book and carefully balanced those findings against the wisdom of Scripture. What he finds is much like the argument Christian Miller presents in The Character Gap: human character can be shaped, there are practical ways to do so, and that those practical means of forming our character look a great deal like traditional Christian devotional practices. Having explained why we so often fall short of our goals of being more self-controlled, Dyck also helps explain how we can get better. He goes well beyond the usual Sunday School response: read the Bible, pray, and attend more church. These are all a part of the formula, but without a little more meat on the bones, such admonitions leave us asking why we haven’t gotten any holier in the past decade. The basic formula laid out in Your Future Self Will Thank You is that we need to incrementally build new habits. Dyck sifts through research that shows that the problem with most of our self-improvement attempts is that we try to change too much too quickly and without the appropriate incentive structures. Dyck uses recent scientific research to show that will power is a finite resource. It can be developed over time. However, our self-control is subject to fatigue. When we are tired, stressed, or distracted we are much more likely to fail in our attempts at self-control. Not coincidentally, this happens to match what Scripture teaches. This is why Sabbath is built into the pattern of Scripture. This is why Proverbs focuses so much on patterns of life. Interspersed with the explanations of why we fail, Dyck has included helpful steps to begin to develop better habits. His examples tend to focus on things that should matter to us as Christians: physical health, stronger prayer lives, more consistent Scripture reading. This is a long way from self-help book designed to unlock ten secrets to build a better you. This is a book that can help provide practical mechanisms to get Christians to develop better habits that lead us toward holiness. Dyck’s book will benefit those who already have a good understanding of spiritual disciplines. For those that don’t, it should be paired with a book like Andy Davis’s, An Infinite Journey: Growing toward Christlikeness or Don Whitney’s, Spiritual Disciplines for the Christian Life. In fact, Dyck’s book fills out some of what is absent from traditional books on spiritual growth because it helps explain why we fail and what, practically, we can do to fail less.